A fine art print of "Hunting in the Fog" will add bold color to your office or living room wall. Bursting through a veil of morning fog, the sun seems to set fire to the sky over Ringneck Marsh. The heavy veil hides all but the ghostly outlines of the trees and the silhouetted birds hunting for breakfast. Start your day like an early bird! 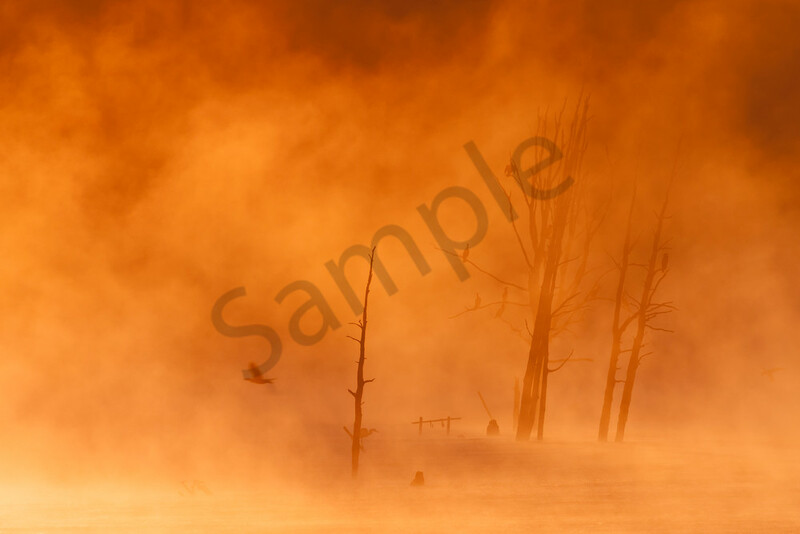 This fine art photograph of "Hunting in the Fog" is in my twilight wall art series. It brings a fiery start to your day wherever you hang it! Best displayed on metal, the bold colors and vivid details captivate the imagination. Each metal print is ready to hang without a frame, providing a bold, modern look. For a softer, more pastel appearance, choose a canvas print. Two museum-quality fine art papers are also available, should you prefer a more traditional look. The sun burns through the morning fog hovering over Ringneck Marsh in the Iroquois National Wildlife Refuge. The heavy veil hides all but the ghostly outlines of the trees and the silhouetted birds hunting for breakfast.